Streptocarpus are originally form South Africa and are sometimes referred to as the ‘Cape Primrose’. Although the common purple flowering varieties with the long tubular flowers are the hardiest. Many of the new cultivars are more colourful. 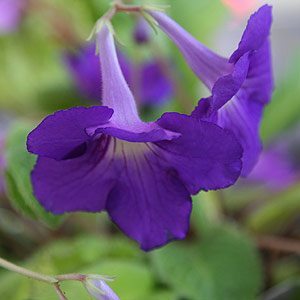 Streptocarpus species are usually grown in hanging baskets, however in the right conditions they have been used as a ground cover plant. Alway grown in a filtered shade position with moist but also a well drained soil that mimics the natural habitat of Streptocarpus Species. 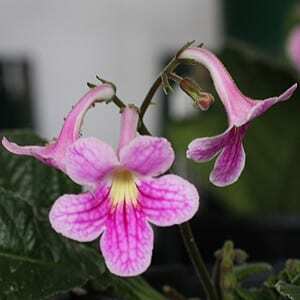 Streptocarpus saxorum is the species also known as the ‘False African Violet’. In Australia Streptocarpus are usually grown indoors, however in warmer climates, NSW north coast and further north, they can be grown outdoors, especially near the coast where temperatures at night do not drop so much. Streptocarpus grow well in similar conditions to that of African Violets however they are probably a little easier. They require a moist soil, however not a wet one. Let them dry out one in while. Watering – The growing medium needs to dry out a little between watering. Wet soggy soils will lead to root rot and fungal diseases. Try once a week during summer, once every 3 weeks in winter. Check the soil before watering and do not allow the pots to sit in saucers of water. Fertiliser – Fertiliser is important for good flower growth. Commence fertilising in early spring using a liquid seaweed fertiliser and continue every 2 weeks until autumn when flowering ends. These are a low maintenance once established they flower freely from the spring through to autumn. 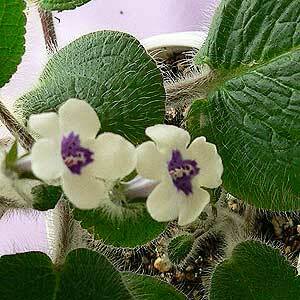 Often grown in the pots used for African Violets with the ‘Wick’ watering system. Old foliage can be removed as needed. Remember to divide Streptocarpus to avoid overcrowding. Fertilize using a weak seaweed based solution. These are a difficult plant to find in nurseries, we suggest you contact your local African Violet and Strepocarpus Society. Or visit one of their shows where plants are often offered for sale.